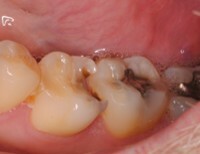 The adjacent picture shows, in the first view, a damaged cusp caused by decay, suspected leakage from an old filling and finally, breakage. The second picture, provides a mirrored view of the extent of damage. 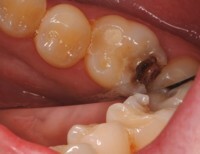 Because of the high biting pressures in the molar areas of our "bite", a tooth that requires common treatments for cavities and fillings oftentimes subjects the tooth structure to a higher probability of failure for some patients. 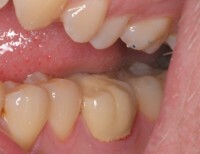 For this patient, a routine filling treatment or a straight forward use of a dental crown has a high predictability for failure due to the proximity of decay that goes deep into the tooth structure, beyond the normal gum line. Root Canal Therapy will remove any quantities of diseased tissue aleady existing and prepare the tooth for warding off any possibilities of future inflammation and infection that would likely cause additional failure and the need for retreatment. 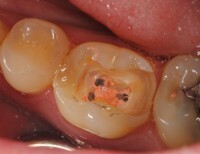 Gum tissue is removed as necessary to go beyond the depth of compromised tooth structure. This is necessary for providing a healthy base that will be an integral part of the cementation surfaces required for stable crown placement. The next photo in this treament series shows how the interior of the tooth is prepared for the root canal treatments that will be provided. A total of three (3) canals are treated. Gutta percha, a rubbery product, is used to fill canals which have been shaped to eliminate any residual tissue that could cause an infection. Once properly sealed, the root of the tooth is then supported by normal healthy bone. The pinkish color of the gutta percha material can be seen in the adjacent photo. Build up material is used to fortify the remaining tooth structure, creating a stable base on which a custom crown is fabricated to replace the patient's missing tooth structure. A temporary restoration is placed on the tooth with the completed root canal to assure that the tooth can withstand normal chewing forces without pain, verifying that the root canal treatment is a success. Any need for bite adjustment or modification of the shape of the temporary restoration is non-invasive and provides time for the patient to accommodate to the changes in the tooth once the initial problem has been solved. 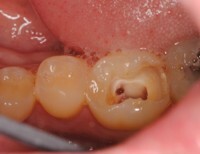 In this case, the height of the tissue had to be modified to expose sound tooth structure for the new crown. This alteration of the tissue height is done so that a natural contour exists between the tooth undergoing treatment and the adjacent tooth. This reshaping prevents any difficulties with accumulation of food debris or bacteria. 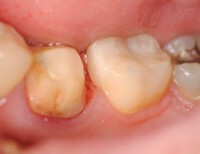 In this case, the amount of tooth structure lost due to decay, made it necessary to place a crown to restore a normal '"bite" and to protect the tooth from fracture or further damage. It is important to stabilize a tooth after root canal treatment as soon as possible.